Personalized wedding favors add a special touch to your intimate wedding! Give your guests an individual, special token of your appreciation, and they'll be fondly reminded of your wedding every time they see your personalized or engraved wedding favor! Your guests will love our newest olive oil soap favor that is wrapped in tissue and decorated with a gorgeous flower and personalized label. Personalized wedding favors are more special to your guests because you had them personalized for them! Our beach wedding favors and our engraved bud vase are some of our unique and elegant personalized favors. Flower boxes with personalized tags are popular for many occasions! 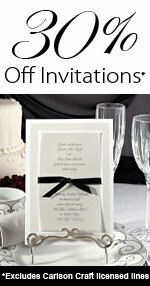 We can help you choose the right favors for your special occasion! Personalized Wedding Favors are doubled checked for accuracy and we will contact you if we have any questions, because we care about making your personalization accurate. Check out our Wedding Catering Tips For Your Reception article.